"Killer" Joe Cooper, he's known as, because of his side work as a professional hit man. Matthew McConaughey continues on his recent roll of stellar turns in smallish movies by playing Killer Joe as a reptilian, black-clad cowboy, again invoking comparisons to Paul Newman with his cowboy-hatted silhouette. 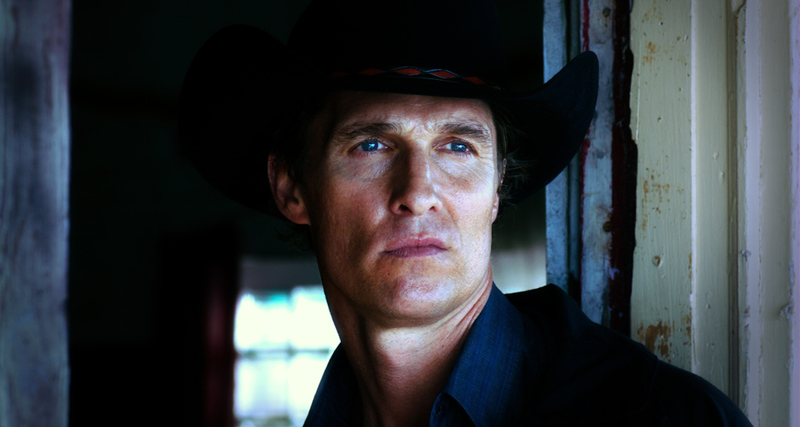 Like Newman's lead turn as a sleazy cowpuncher in Hud, Killer Joe dirties up the studly image of McConaughey, who only recently seems to have awoken from his commercial sellout stupor. With this and his supporting turn in Magic Mike, McConaughey announces he's comfortable with the premature plaudits he received as the Next Big Male Star after he first made a splash in Dazed and Confused. McConaughey's performance is a standout in a film full of stellar turns elicited by Friedkin. Perhaps the weakest link is Emile Hirsch as the man-child Chris, who convinces his dad, Ansel, and step-mother, Sharla, to hire Joe to off Chris's mom. Together, they hope to cash in on an insurance policy meant to be paid out to Chris's virginal sister, Dottie (Juno Temple). Part of the film's black charm is watching these three rubes stab each other in the back and step all over each other in order to make a paltry $50,000. The minimal sum becomes even smaller once Joe's fee is taken into account. But things begin to go awry even earlier, when Joe suspends his usually inviolable rule of receiving payment upfront. Instead, he agrees to take teenage Dottie as a sexual retainer, a fact that doesn't phase Ansel (Thomas Haden Church) or Sharla (Gina Gershon), but begins to stick in a jealous Chris's craw. Killer Joe's typical noirish set up soon builds to a brutal climax involving white-trash stupidity, sexual infidelity, familial double-crosses, and a chicken leg from Kentucky Fried Chicken—or K-Fried-C, as Sharla calls it. Though disturbing in Friedkin's provocative application of sexual humiliation and violence, the extended scene is admirable in this relatively conservative era because it doesn't pull any punches. 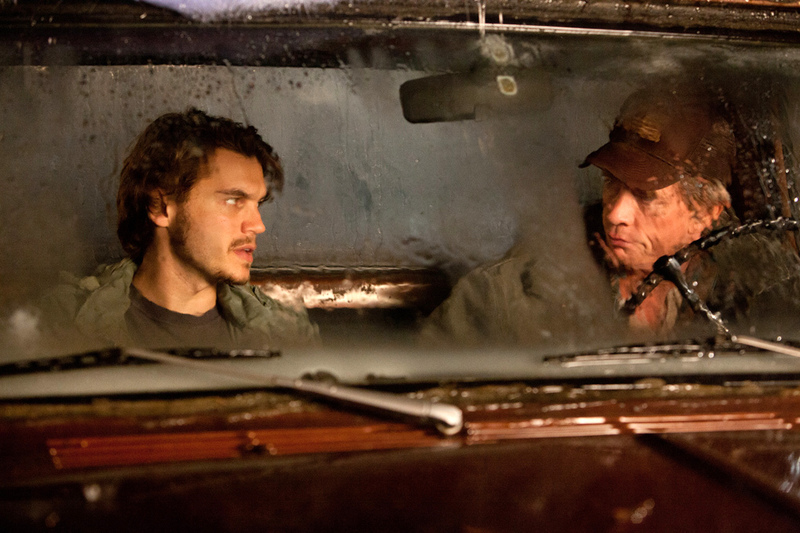 Gershon is as game to participate in the unsettling scene as McConaughey and Friedkin are. The setpiece serves as a reminder of the uncompromising director's pioneering penchant for provocation, a sense of intrepidness that Hollywood followed for a brief moment before it was derailed by the commercial prospects promised by the box office success of Jaws and Star Wars. 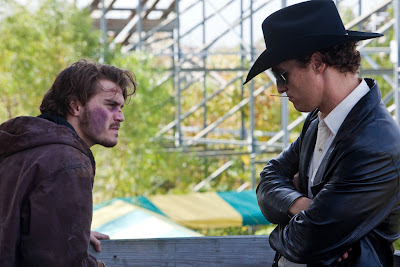 Killer Joe plays like a movie one would see in the multiplexes of an alternate universe where art reigns over commerce. Very, very twisted movie but it also has some amazing performances from this small ensemble, and gets extremely tense in the last 15 minutes or so. McConaughey totally deserves a nomination for his role as the self-titled, Killer Joe. Good review Tony. Cannot WAIT to see this. Missed it at the flicks so waiting for the DVD in November.